Continuous improvement of processes within companies requires innovation. Therefore, the project deals with the question of how to support the development and implementation of these innovations. 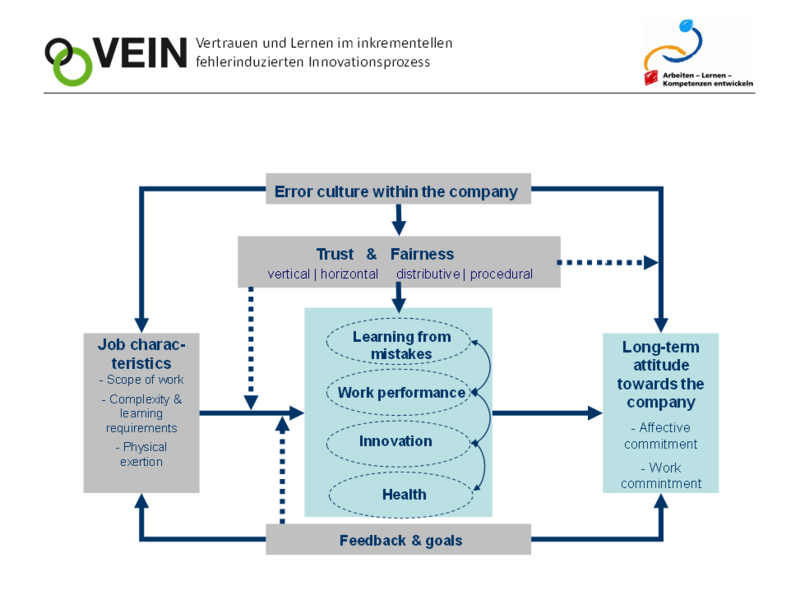 A central assumption within the VEIN project is that, above all, mistakes and problems at work are possible indicators for improvement. Thus, each employee can contribute improving the company’s situation when it perceives mistakes as opportunities for learning and innovating, and deals with them constructively. This however requires a culture of trust between the employees and also between employees and their superiors. Success factors for an innovative constructive culture of dealing with mistakes and errors, were developed jointly with two industry partners. The approach consists of three phases: In the first one, we identified planning and work processes and modeled them. 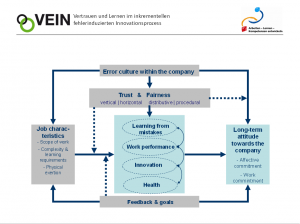 Furthermore, we identified factors that are particularly relevant for an innovative constructive culture of dealing with mistakes. In a second phase, these success factors are varied by systematically structured interventions / experiments in industrial production environments of the participating partners under differing prevailing conditions. Afterwards the success of these interventions is evaluated. The third phase is meant to comprehensibly prepare the findings gained by the experiments whereby particularly transferability and dissemination opportunities are examined (see Figure 1). We analyzed the existing trust between employees and between employees and superiors with the focus being on the promotion of processes of learning. Furthermore the organizations’ ability to innovate was measured. The goal of the project is to analyze these factors and to evaluate and test transferable solutions on both a theoretical and empirical level. This is conducted in an interdisciplinary collaboration of three research institutions, selected companies in industry and various transfer partners.